The body mass index formula, or BMI formula, is relatively simple. You can use it as a passable measure to figure out whether you're underweight, normal weight, or obese for your height. And while calculating BMI isn't the best way to figure out how healthy you are, it is quite convenient. Below you can find the BMI formula, a calculator to determine your own BMI, and why (if you're serious about being healthy) you won't place too much importance on whatever your BMI is. Though your BMI has little to do with whether you look ripped. That's dependent entirely on your body fat percentage (how much fat you have). Your body mass index is just a ratio of your mass divided by your height squared. It's a very general measure used to assess whether you're at a healthy weight for your size. NOTE: Any BMI less than 17.5 is considered clinically anorexic. The formula is simple, but lets make it even easier. 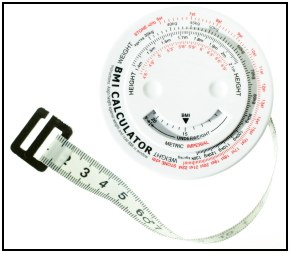 Just plug in your weight to the calculator below to find out your own BMI and its associated rating. You can also enter your weight, height, and age below to see on the graph how you compare to other people your own age. BMI is on the vertical axis and your age on the horizontal axis. Note: The graph below requires Flash to use. The BMI formula is an OK way of finding out if you're at the right weight. But it has some very significant limitations. Since it deals with only your height and weight, the results it gives back are skewed against athletes and fitter people in general – because athletes aren't 'normal', especially in the context of the weight of the average American. Athletes generally have more muscle than fat, but muscle weighs much more than fat. Thus, a bodybuilder might be labeled obese because he weighs so much, when it's really all muscle. And thin, athletic runners might be labeled underweight because they have less fat than other 'normal' people their height have. The BMI formula also fails to take into account body frame. Some people, whatever their body composition, are built bigger, wider, smaller, thinner, etc. Simply, BMI is an OK tool for statisticians to use to analyze the population. But it’s a bad tool for gauging your own weight and health. So, what's the best way of finding out if you're the right weight? Measuring your body fat percentage (i.e. body composition) is the ultimate way to determine whether you're overweight, underweight, too thin, or normal. Using skinfold calipers is good, but hydrostatic weighing is the best method to use. Determining your body composition tells you how much you weigh, how much of that weight is lean body mass (e.g. bone, muscle, organs, etc.) and how much of that is fat. If you're serious about finding out how much fat you have, try it! If you're an athlete, or just want to really accurately find out whether you're carrying more fat than normal, measure your body composition. It can be a bit of a pain, but the information you get is extremely useful. • Click here to leave 'The BMI Formula: What It Is, How To Use It, and Why NOT To Trust It' & go back to the Home-page!